Every year, the market joins with Slow Food Russian River to honor the Gravenstein Apple. It’s a party with a purpose. 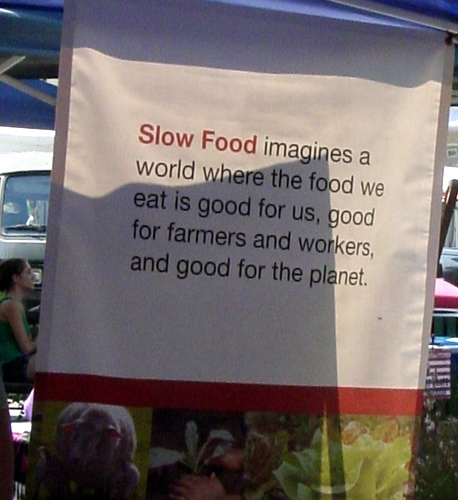 Slow Food Russian River was also a factor in bringing back the Bodega Red Potato. 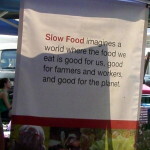 Thank you Slow Food Russian River for bringing back food – where the most important factor is that it tastes good. 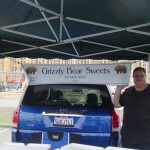 This Saturday August 24 is going to be a great market. Chef Una demonstrating apple recipes, activities for kids, and apple tastings. Tomorrow is the Gravenstein Apple Celebration! 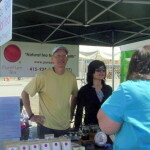 Sonoma Woodworks will be here!! 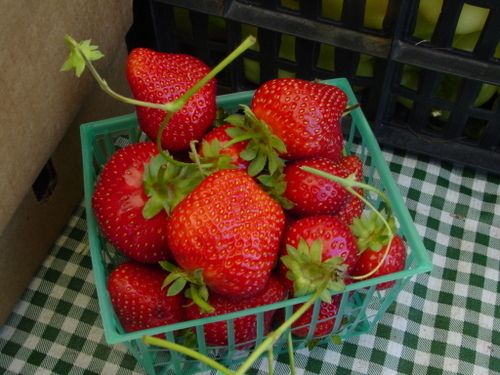 It’s Labor Day – the unofficial start of fall — but summer still reigns at the markets. Saturday is the ginormous market. 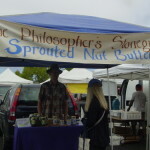 If it grows in Sonoma County, you can get it at the Saturday market. It’s the perfect place to kick off your weekend. 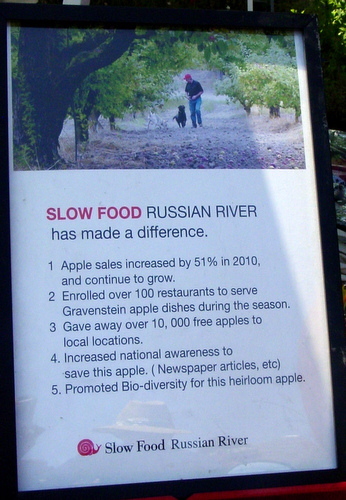 This week we join with Slow Foods Russian River to Honor the Gravenstein Apple. Tastings and activities for kids. It is always lots of fun. 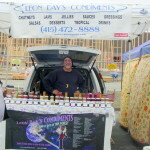 The market is located at the gateway to wine country. There are some great wineries within a mile of the market. It’s also a great time to check out the art galleries in Luther Burbank Center for the Arts. 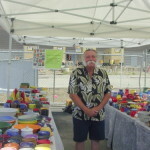 Many local artists are featured. 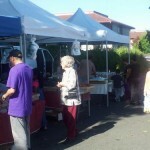 The Wednesday market is the only time you will find Pennyroyal Farm Cheeses at the market. They recently won a blue ribbon for their blue cheese. It is perfect with pears, apple, figs and so much more. The Dreamcatcher Ranch is another Wednesday only vendor. Great tasting humanely raised meat. It’s all good but the pork products are especially good. Body Balance Massage is new to the Wednesday market — all that was needed for the market to be the perfect spot for a mid-week pick me up. 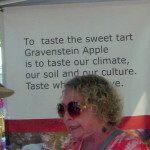 Every year Santa Rosa Original Certified Farmers Market celebrates the Gravenstein Apple. This year the August 24th party includes tastings, fresh pressed apple juice, crafts for kids and lively music. 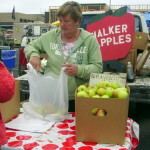 “Today only one commercial shipper of fresh Gravensteins remains in Sebastopol, 80-year-old Lee Walker. As he related on a recent visit to his orchard, his ancestor Joseph Walker discovered Yosemite Valley in 1833, a little more than a decade after Russian settlers introduced the Gravenstein to Fort Ross, on the Sonoma coast. Joseph’s brother settled in Sebastopol about 1850 and raised cattle and apples on 7,000 acres. A neighbor named Griffeth established the first real Gravenstein orchard in the 1880s, and in 1910, Lee Walker’s maternal grandfather planted the Gravensteins on the home ranch where we strolled. The storied history of the Gravenstein apple has all the elements of a great read – discovered along the Denmark border in 1669 as a chance seedling, introduced by German immigrants to North America in 1790, then brought to Northern California by Russian fur traders in the 1800s. By the early 1900s, thousands of Gravenstein orchards were established and the apple had become the heart of a major industry in Sonoma County as dryers, canners, apple cider and apple brandy producers took advantage of its suitability for processing. During World War II, American soldiers abroad were provided with applesauce and dried apples produced from Gravensteins grown in Sebastopol, turning the apple into an icon for the town. 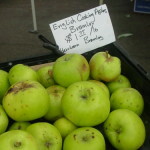 Gravensteins ripen in late July – making it one of the first apples in North America ready for market. The Grav is a squat, irregularly-shaped apple with a short stem that comes in a variety of colors; most commonly, though, with a greenish yellow background covered with broad red stripes. With a crisp and juicy texture, full of old-fashioned, sweet and tart flavor, it’s widely-regarded as the best all-purpose apple for sauce, pies and crisps; naturally delicious plucked ripe from the tree and eaten fresh as nature intended. Like any page turner, our story unfolds to embody elements of vulnerability and adversity. The staggered ripening of fruit presents a challenge for picking during a brief harvest season; and once harvested, Gravs are extremely delicate and highly-perishable – they do not travel well, nor keep their integrity for long. The fruit is losing market share due to an alarming loss of land, as orchards are being converted to vineyards. During the past six decades, Sonoma County’s Gravenstein orchards have declined by nearly 7,000 acres, currently down to about 500…and counting! When you add to this scenario the economic realities of apple growing – pound for pound Pinot Noir grapes fetch four times the market price – it’s easy to understand why the survival of the Gravenstein apple is in jeopardy. Adding insult to injury, growers say a huge part of the demise of the Gravs and the USA apple market, in general, is the flooding of our country with apple juice concentrate from China used to make cheap juice drinks for the masses. Some of the apple orchards grow on land that been the property of apple farming families for generations while others are operated by tenant farmers. These farmers rely on the support of landowners who who could sell their land for grape production but have decided that the area’s apple tradition is more important than personal financial gain. 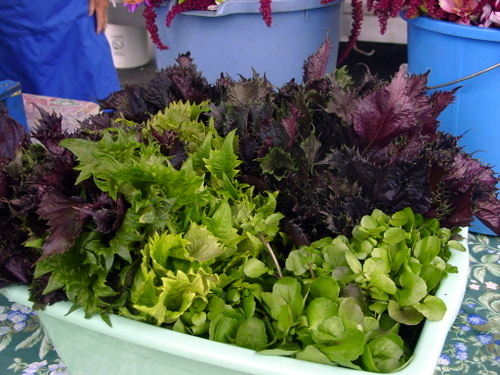 Only a dozen commercial growers and two commercial processors remain in Sonoma County. Production is now only a tiny fraction of its historic high levels, and continues to diminish as small farmers struggle to market their heirloom fruit. If this were a novel? it would be nothing short of a tragedy. But you can take heart, Dear Reader, for the last chapter has not yet been written! For close to 10 years, a small cadre of true believers have sought to slow the erosion of Gravenstein apple orchard production. 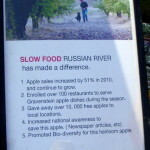 Under the auspices of the aptly-named Slow Food Russian River Convivium, a regional chapter of Slow Food USA, the Save the Gravensteins Presidium – nicknamed The Apple Core – works to promote and protect farmers who nurture their apples from tree to table. Inherent in this mission is a mandate to create and propagate a lively demand for this true delicacy through ongoing educational efforts and seasonal awareness campaigns. 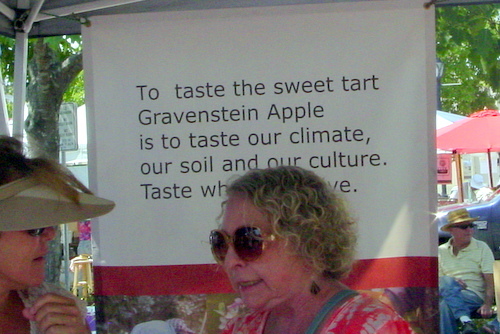 FAQ: What can I do to help preserve the Gravenstein apple for generations to come? Answer: Seek out Gravensteins at roadside stands! Ask for Gravensteins by name at your local market. Plant a Gravenstein apple tree (or three) in your backyard. Visit our local farmer’s markets this month to taste freshly-pressed Gravenstein apple juice. Support educational programs about Sonoma County’s heritage apples in your schools. Bake a Gravenstein apple pie or crisp with your children. Take a bite out of one today. Slow down and enjoy life! Source material provided by Slow Food Russian River, Cittaslow Sebastopol and The Apple Core. Mid August might be the best time of the year to be in Sonoma County. Everything is in season. 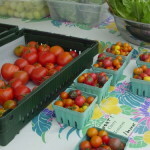 Many vendors have case prices on peaches, tomatoes and cucumbers. Chef Jennifer Una demonstrates seasonal cooking. Recipes include: grated apple slaw, mixed melon gazpacho, summer squash and padron skewers, peaches and cream parfait with stewed rhubarb. 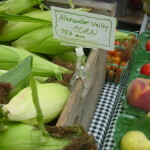 Ridgeview Farm is only at the Wednesday market. If they were the only vendor it would be worth coming. Known for the beautiful seasonal bouquets – right now Zinnias, they also have corn, melons, lettuces, french breakfast radishes. Many heirloom varieties , always picked the peak of flavor. 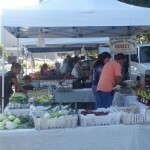 Penny Royal Farm/Navarro Winery is another Wednesday only vendor. They have a wide variety of vinegars, ver jus , wine and cheeses. Their blue cheese is wonderful. Bohemian Wellbeing Farm has the best selection of cultivated and foraged mushrooms any day of the week. Full Circle Bakery has great breads and pastries. Waterhorse Ridge has jams, jellies, condiments and other preserved fruit. You can find a plain strawberry or grape jelly but it’s the combinations of flavors that will intrigue your palate. Savory jars of things too — not too mention salsa that are downright hot. Gaga Cafe and the Green Grocer are here for a great cup of coffee and one of the greatest BLT’s of all time — and that’s even when tomatoes are out of season. Now they are beyond wonderful. 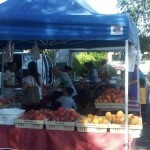 Dry Creek Peach will be at market tomorrow! 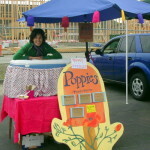 Sonoma Woodworks will also be at market tomorrow! La Vida Buena Nursery is back from maternity leave! 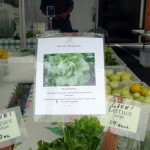 This special summer market is filled with the wonderful seasonal fruits and vegetables. It’s a great quck-stop for everything you need for a seasonal meal.